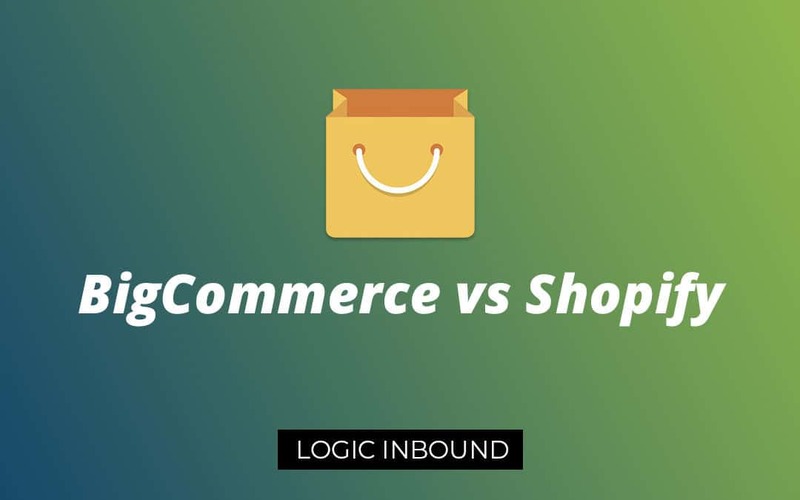 As eCommerce platform software-as-a-service (SaaS) products like Shopify and BigCommerce continue to gain popularity, the important question, “Which of these is best?” arises. The reality is that there isn’t a ‘best’ eCommerce platform out there. Different platforms cater to different audiences and fulfill different purposes. BigCommerce and Shopify enjoy a respectable market share of global eCommerce websites. While they’re billed as complete eCommerce SaaS solutions, they do differ in some crucial ways. In this BigCommerce vs Shopify review, we’ll be comparing these popular platforms and figuring out the key reasons over why you may want to choose one platform over the other. So if you’re looking to start an eCommerce store, BigCommerce and Shopify are bound to come up as the top contenders. The decision to go for one of these solutions over the other will come down to your own requirements and expectations. Thus, it’s necessary to know how you envision your eCommerce store to function in the technical aspect, and how these platforms’ features will help you achieve that. Pricing - Is BigCommerce Cheaper than Shopify? Which is More Popularity BigCommerce or Shopify? A professional and clean website design makes a good impression on its visitors. If customers feel welcomed when they’re on a website, they’re more likely to browse around and make a purchase. A badly designed website on the other hand can create problems for your business on several fronts. Firstly, it does not convey a positive image to visitors. So no matter how great your product selection and customer service is, visitors will simply leave without giving your website a chance. This increases your website’s bounce rate, which in turn negatively affects its SEO performance. SEO is crucial for getting organic traffic through search engines, which is where the real profits lie for eCommerce websites. That is why it is important that your eCommerce solution has a selection of well-designed, mobile-optimized templates. BigCommerce offers a selection of 127 templates, out of which 7 are free. 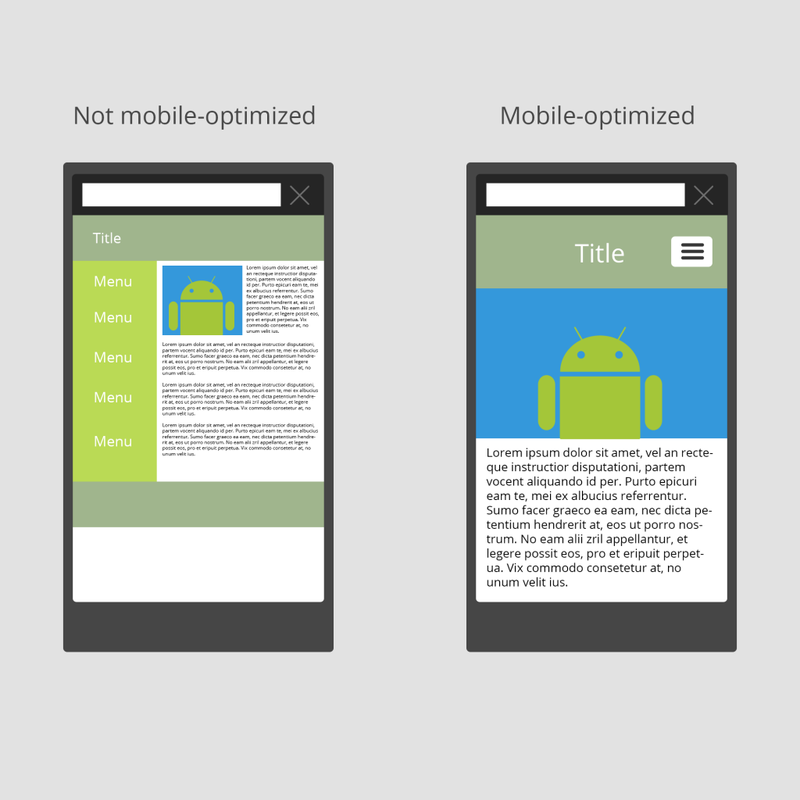 The free templates are very well-designed and fully optimized for mobile devices. A slight quirk of the template selection is that theme variants (same structure, different colors) are listed as entirely separate themes. What this means is that there are basically only 2 free templates for BigCommerce, offered to users in slightly different color variations. So the 120 paid templates offered might in fact be just 40-50 templates offered in different color variations. Besides this issue however, we have no qualms with the quality of the templates offered. Most of them feature distinctive, modern and responsive designs. Prices for paid official BigCommerce templates start at $145 and go up to $235. 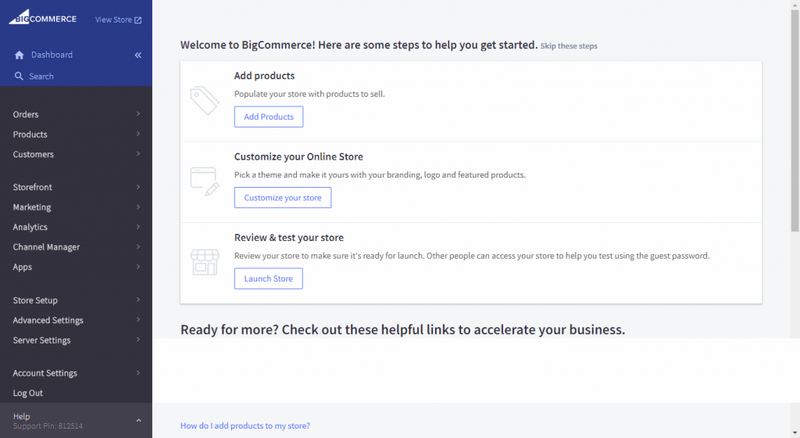 The BigCommerce template store itself has been nicely designed. Templates can be filtered according to industry and ‘collections’ (template structure). While browsing through the various BigCommerce templates, we couldn’t help but notice that the design language doesn’t vary that much between them. For example, most of these feature square edges. 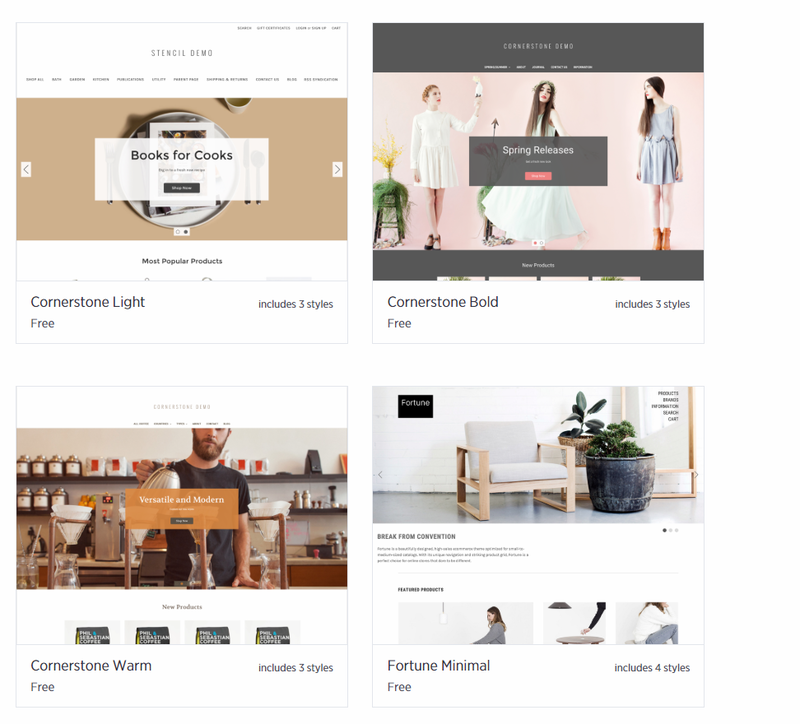 The Shopify template store offers a selection of 62 templates, out of which 10 are free. Unlike BigCommerce, Shopify doesn’t list all the template variants as separate items. In fact, each of the templates (including the free ones) comes in two or three design variations, so there’s a bit more choice than you might expect. Design-wise, the Shopify templates are very hard to fault. All of them have a meticulous and modern design language that will invite users to browse through your store. All of the templates are fully responsive, so they’ll look great regardless of the device from which they’re being accessed. Prices for paid Shopify templates start at $140 and go up to $180. Can’t quite find a template that you like on the BigCommerce and Shopify websites? Fortunately, there are third-party marketplaces such as Theme Forest that host BigCommerce and Shopify templates. What’s more, you’ll quite easily find a high quality premium template here that undercuts the official templates in price by quite a margin. While browsing for templates on Theme Forest, we noticed that there are almost 600 Shopify templates on sale here. In contrast, there are only 53 BigCommerce templates on this marketplace. This is in a way, directly indicative of the difference in popularity between these two platforms. Both Shopify and BigCommerce are built to be easy-to-use and intuitive products. But even then, some users might need additional help from customer support. Fortunately, both these platforms offer online support on all subscription plans. BigCommerce offers 24/7 access to its online support team. Users can contact them via email, phone and live chat. In our experience, live support was responsive even during off-peak hours and served helpful resolutions to most queries. Like BigCommerce, Shopify offers 24/7 access to its support team via phone, email and live chat. The platform’s live chat support is spot on and the ‘gurus’ (support personnel) make sure that you find a solution to your problem. We even tried phone support and were not disappointed with the experience. You really won’t run into problems as far as customer support is concerned for either of these platforms. Pricing – Is BigCommerce Cheaper than Shopify? BigCommerce and Shopify are SaaS eCommerce products, and as such charge their users a monthly fee. The pricing is certainly important, but it shouldn’t be the sole factor to base your decision on. BigCommerce offers a 10% discount on the Plus and Pro plans if you choose to go for annual billing. BigCommerce say that going over the sales limit will not necessarily lead to a halt in online orders. Rather, the service gives users a buffer of 1000-2000 orders before they are forced to upgrade the subscription plan. The sales limits are there for an obvious reason. The more profitable an online store is, the more it has to pay BigCommerce. Lite: $9 per month. Basically a Shopify Buy widget for websites. 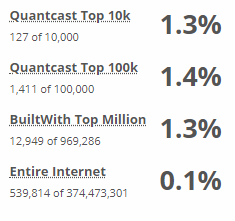 Does not include store builder. Shopify Plus: For high-volume merchants. Custom pricing for every customer. Prices vary according to requirements and reportedly hover around $2000 per month. The entry-level Shopify Lite plan undercuts entry-level BigCommerce pricing significantly. However, this plan is offered at such a low price because it doesn’t include to Shopify’s store building tool. It allows users to make use of a Shopify ‘buy now’ button, which can be embedded on existing online stores or Facebook pages. This can be useful for users who simply want to use Shopify’s backend for order management and to keep a better track of sales. Also, there are absolutely no sales limits on any of Shopify’s subscription plans. That means even users of Shopify’s ‘Basic’ price plan can make as much sales as they want, without fears of orders being halted by the service. Shopify on the other hand charges transaction fees of up to 2% for each sale your online store makes. And this is before you factor in the credit card rates levied by a payment processor (Stripe, for example). 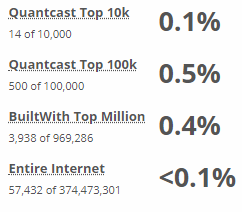 BigCommerce definitely pulls ahead here. Not only are there no transaction fees on sales, but if you choose PayPal as your BigCommerce credit card processor, you get lower rates than Shopify Payments on all plans except BigCommerce Standard. The popularity of a product or service means that it is offering something that resonates with the audience. Continued popularity is also a good signifier of reliability and customer satisfaction with the product or service. The popularity of paid eCommerce SaaS products like BigCommerce and Shopify contributes directly to their parent company’s revenues. Good revenue fuels research and development efforts which in turn lead to regular security and feature updates. So in terms of popularity, how do BigCommerce and Shopify stack up? Shopify is currently the leading paid eCommerce platform. More than 500,000 eCommerce sites use the service, easily making it one of the most popular (including free) eCommerce services out there. BigCommerce meanwhile, is being used by just above 57,000 eCommerce sites around the globe. This is by no means an unpopular product, but it has not been able to attract as much attention as Shopify. Google processes millions of searches each day. As such, its search trends can be used to gauge the level of user interest in a service or product. The image above shows user interest for Shopify increasing at a steady pace, which is a good signal for its growth. BigCommerce meanwhile, seems to be attracting the same amount of searches year after year. At least when it comes to Google searches, Shopify pulls ahead with a significant lead. Shopify, a publicly traded company currently listed on the NYSE, generated $580.9 million in revenue in 2017. BigCommerce despite only having a tenth of the market share, reportedly crossed the $100 million mark last year in revenue. So while BigCommerce’s customer base isn’t as impressive as Shopify’s, it’s certainly generating a lot of revenue for the company. Plugins and apps can often make up for a product or service’s shortcomings when it comes to features. It also allows you to expand the functionality of your platform by choosing only the features that you need without having unnecessary modules to slow things down. A healthy selection of apps and plugins is necessary for an eCommerce platform’s viability as a long-term option. If there isn’t much developer support available for the product, it could be a sign that the product simply isn’t popular enough to warrant third-party support. The BigCommerce App Marketplace features a selection of over 500 apps for the platform. These include some big names such as Intuit QuickBooks, MailChimp, ShipStation and Zendesk. The app selection is quite diverse, and the website allows users to filter apps based on category and sub-category. This makes browsing much more efficient and might bring you across apps you didn’t know existed for the platform. The presence of apps such as Zendesk and PayPal Marketing Solutions gives us an idea of the diversity of customer audience for BigCommerce – these are services geared towards medium-to-large sized online merchants. BigCommerce clearly has a foothold in this market. 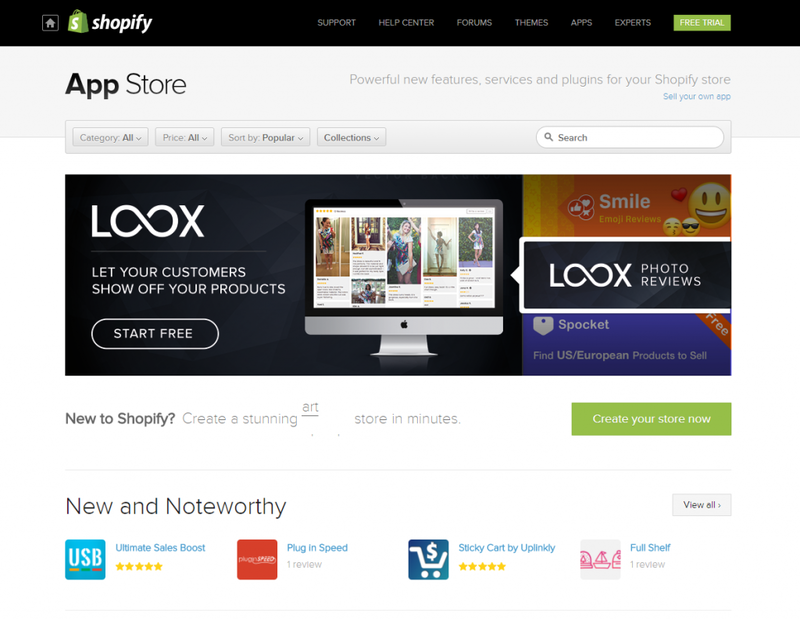 The Shopify App Store hosts more than 2000 apps for the platform. A special mention must go to the App Store itself as it features a very well-designed interface, with a curated list of apps featured at the top. The design is quite reminiscent of a smartphone app store, which makes browsing and navigating a pleasant affair. The variety of apps offered here is also quite impressive. 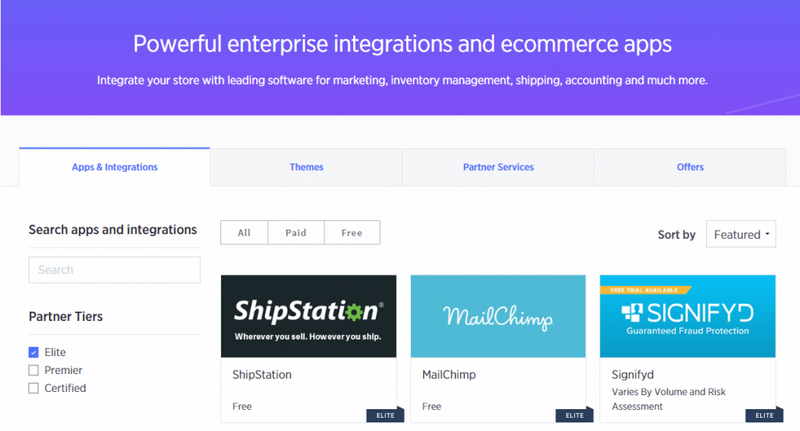 Top tier services such as Intuit QuickBooks, Printful, ShipStation, Oberlo and MailChimp all have integration apps available on the Shopify App Store. Both BigCommerce and Shopify come with an impressive set of features designed to let users setup a fully functional, professional online store. What we’re curious to find is whether there are any significant differences in the features offered by both these platforms. Shopify product options feature allows you to set up to 3 different product options for a product. For example, a t-shirt may have options such as size, color and material. But any more than that and you’re out of luck. There are apps available that allow you to work around this limitation but they’re unintuitive and time-consuming to implement. BigCommerce product options feature easily beats Shopify in this regard, and in a significant way. That’s because the platform has no limits whatsoever to the number of product options. This is crucial for many businesses that sell complicated products. iMovR is a perfect example of this – each of their products has up to 10 different options. Dropshipping is a type of eCommerce business where you don’t have to keep stock of the products you’re selling. Rather, when an order is made on your website, it is routed to a supplier who is then responsible for shipping the ordered goods to the customer. This convenience appeals to many online retailers, but it has also become the reason why there’s such fierce competition in this business. Both BigCommerce and Shopify can be used for dropshipping. Also, there are apps for these platforms that allow you to use major fulfillment services. These include Oberlo for Shopify and Ali Express Dropshipping for BigCommerce. Both Shopify and BigCommerce allow you to setup a point of sale operation using their platform. But Shopify goes a step further here and offers its own official POS hardware. This includes a bar code scanner, a receipt printer, a credit card reader and a till. Because this is official hardware, it can be easily integrated into your Shopify store’s system. Any sale that is made through the POS will automatically be recorded and the backend will update inventory levels appropriately. BigCommerce does not have its own proprietary POS system. Rather, it features native integrations for popular POS platforms such as Square, ShopKeep and Springboard. This can be very beneficial for users who’re already running a POS operation using these platforms and want to branch out into eCommerce. 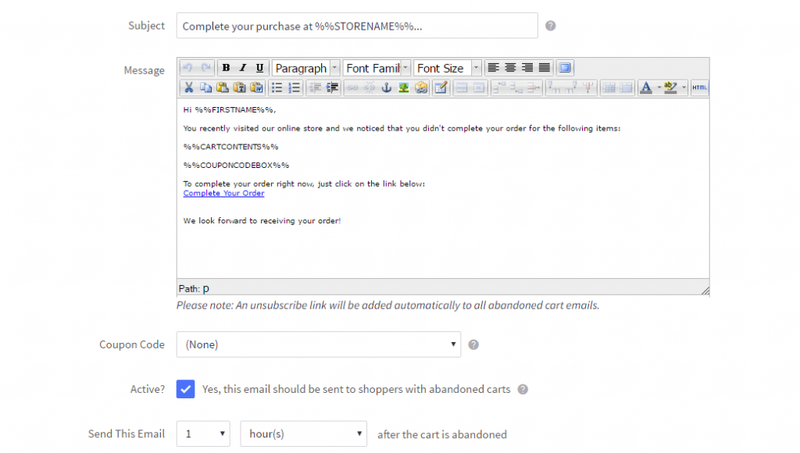 Abandoned cart recovery is an eCommerce feature that allows you to automatically email customers who add items to their shopping cart but do not go through with the purchase – thus the term “abandoned cart”. BigCommerce and Shopify both offer abandoned cart recovery, provided that you opt for one of their more expensive plans. For BigCommerce, that would be the Plus ($79.95/month) plan and up, while Shopify users can avail this functionality starting from the Shopify ($79/month) plan. For flexibility, BigCommerce allows users to send the email 1-23 hours or 1-10 days after the cart is abandoned. 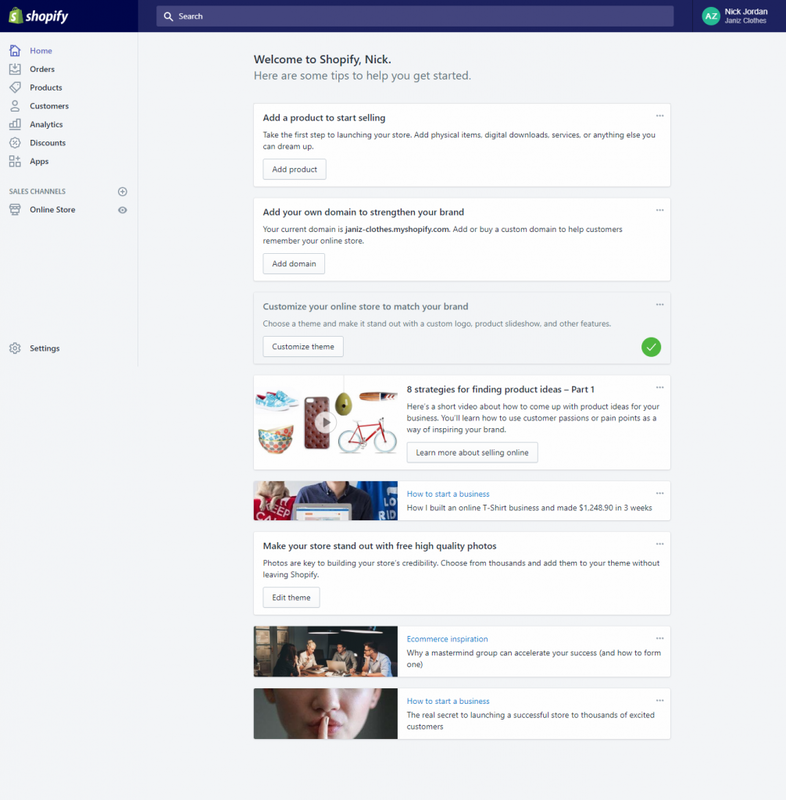 Shopify bases this feature decision on their marketing research. According to the company, customers who abandon their carts are most likely to come back and complete the purchase if they receive the notification email 1 hour or 10 hours later. Content marketing is one of the best ways of getting organic traffic to your website. The same holds true for eCommerce sites as well. An increasing amount of online stores now feature a blog that has audience-relevant content. This boosts the company’s image as an authority in their domain and can often win them recurring customers. Both Shopify and BigCommerce allow their users to attach blogs to their eCommerce site with absolute ease. In Shopify, it’s just a matter of navigating to Online Store > Blog posts > Create blog post. BigCommerce features built-in integration for Disqus, a popular blog commenting tool. In Shopify, fans of this tool will either have to opt for some template tinkering, or purchase a paid app from the App Store. 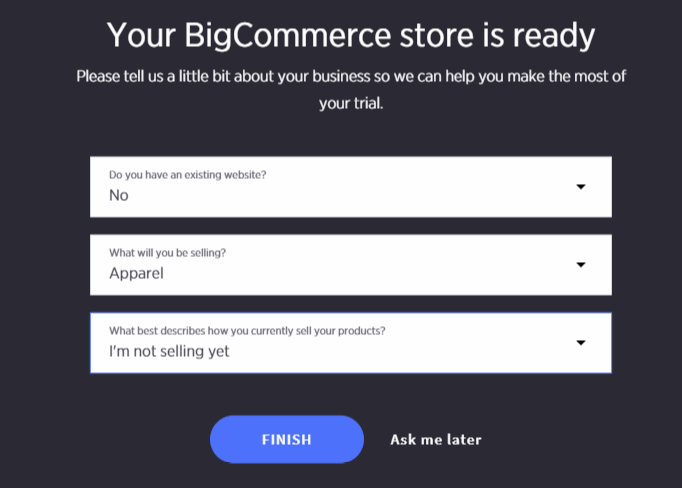 BigCommerce and Shopify are eCommerce SaaS solutions that aim to provide an easy way for anyone to create an online store. But how easy to use are these products in practice? Both BigCommerce and Shopify provide an extremely straight-forward way of setting up your online store. Simply go to the respective service’s website, sign up for a free trial and you’ll be taken to the service’s backend dashboard to get started. It really is that simple to create an eCommerce store using any of these platforms. In this regard, both the platforms perform equally well. BigCommerce and Shopify feature extremely intuitive and well-designed backend dashboards. Access to common functions such as product management, storefront customization and order management is only a few clicks away. The aesthetic of both dashboards is quite minimalistic and there is no visual clutter to distract from the task of managing your eCommerce business. We really cannot pick out a winner here – both platforms have meticulously-designed dashboards with an easy to navigate interface. We did notice a difference between the search functionality provided in the dashboards in these platforms. For example, if you search for “blog” in the Shopify dashboard, the interface will serve helpful links to the query. Doing a similar search for “blog” in BigCommerce’s dashboard will yield no results. This behavior will definitely catch a lot of users off-guard. That’s because the search functionality it seems is only there to search for orders, products or the store’s customers. Bummer. A huge draw of services like BigCommerce and Shopify is that they allow users to customize the look and feel of their online stores. 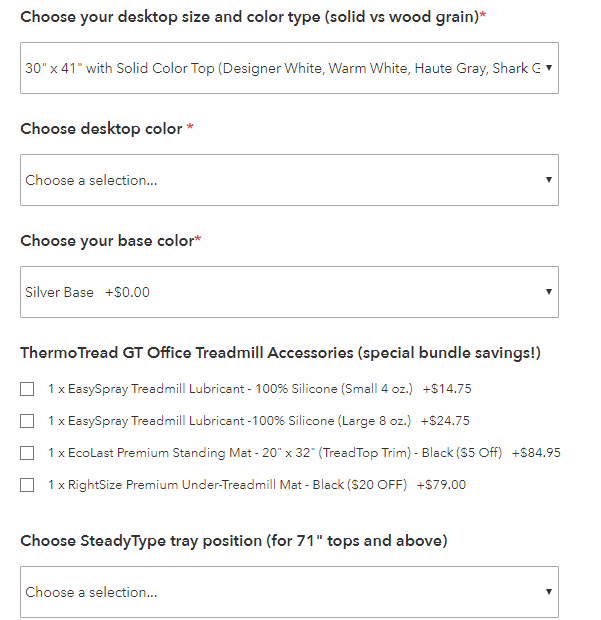 While using the BigCommerce site editor, we couldn’t help but notice that the only customization options available are for changing colors. A simple task such as changing the text on the slider carousel seemed to be quite a challenge. 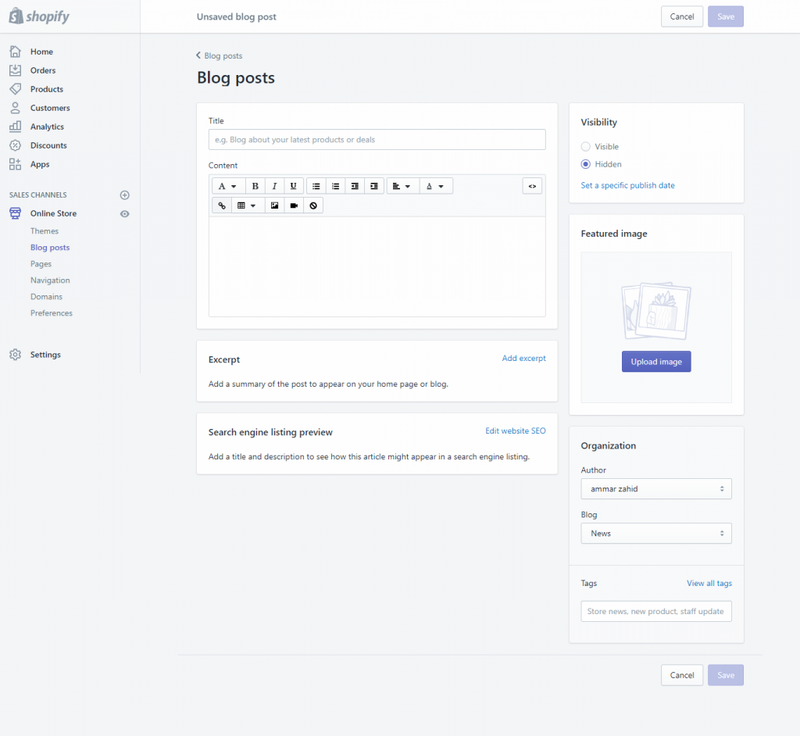 The Shopify site editor on the other hand is much more intuitive and easy to use. 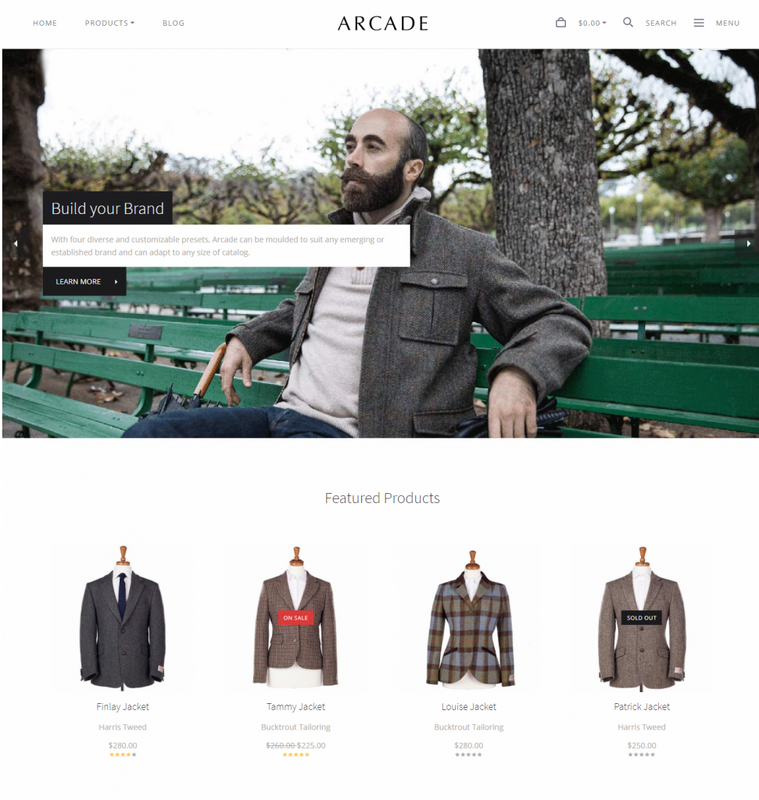 It also feels noticeably more responsive to inputs than its BigCommerce counterpart. The options listed in the customizations panel are easy to understand and give a fair idea about their intended usage. There is no clear winner when it comes to BigCommerce and Shopify. Both are actually quite similar in functionality and are priced very competitively against each other. The standout differences between these platforms have to be Shopify’s better user interface, superior template and app/plugin selection, and the proprietary POS system. If you’re looking for an eCommerce platform you can rely on to cover any present or future requirements, Shopify is a better choice since it has great third-party development support which ensures that additional plugins and apps are in constant development. Shopify’s point of sale system cannot be overlooked either. 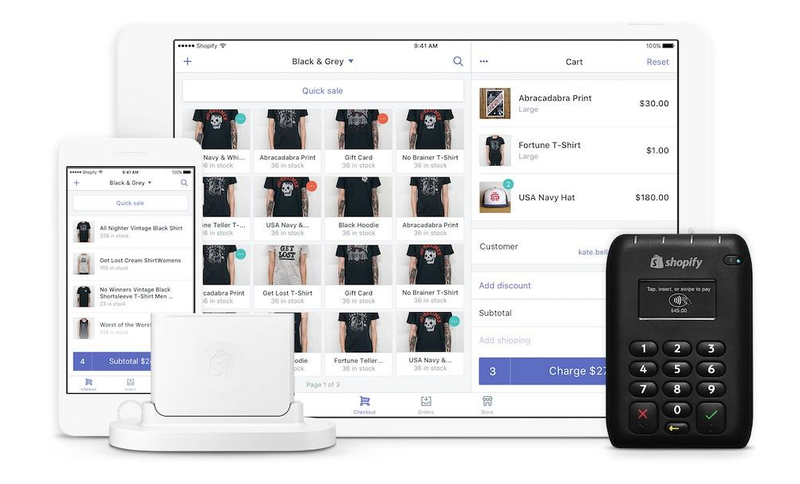 Brick and mortar operations who wish to expand into the digital space can easily turn to the Shopify ecosystem with its powerful eCommerce tools and tightly integrated POS. But there is an area where BigCommerce has a definite advantage – product options. Businesses that sell complex products with lots of options will appreciate the platform’s flexibility in this regard. It literally sets no limits to the number of options a product can have. In fact, Shopify’s limit of just 3 product options could be a deal breaker for these businesses. Real-time carrier quotes available on entry-level plan, the same feature is only available for Shopify’s Advanced ($299/month) plan. Unlimited product options, whereas Shopify only offers 3. More flexibility in options related to abandoned cart recovery. Lower credit card fees, provided you use the default PayPal payment processing option. Flexibility in choosing third-party POS solutions such as Square. Better selection of templates, even on third-party platforms such as Theme Forest. A lot of options for dropshipping. Fully integrated POS system with proprietary hardware. No sales limits on any price plan. App/plugin selection is considerably larger, which means better potential for additional functionality.